For me, going to a bookstore has always been an exciting outing. Whether it was Woozles in Halifax, the Box of Delights in Wolfville, Gilbert Joseph in France or Novel Idea in Kingston, shopping for books has always been fun. 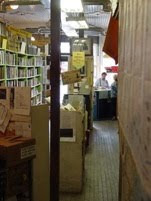 Today Shelagh Rogers’ CBC radio show The Next Chapter reported the closure of Pages Books & Magazines in Toronto and Granny Bates in St. John’s, both community staples in their own right (and certainly not the only independent Canadian bookstores to close in the last little while). Reports like this one are really sad, partly because I wonder whether the stores are closing because of the economy or because people just aren't patronizing them any more. I really hope it's not the latter, because we so need bookstores in our communities. Bookstores, especially children’s bookstores such as Granny Bates, have the opportunity to make books magical. And really, grown-up bookstores have the chance to do that for adults, who almost need it more because it becomes so much harder to fit reading into your life as you get older. Either way, though, local and independent bookstores (and maybe Chapters on occasion too) are perfect places to browse, to discover new things and to find new interests. I rarely know what I’m going to buy when I head to a bookstore, but I rarely leave empty-handed. So, today I am celebrating bookstores. To listen to The Next Chapter, click here. To find an independent bookstore near you, check out the Canadian Booksellers Association.